Our vacation rentals in Perdido Key, Florida offer a wide variety of amenities for an unforgettable getaway. 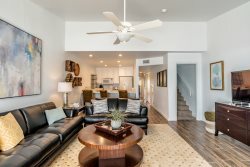 With beautiful modern spaces for rent in private gated communities or cozy cottages on the waterfront, we are proud to offer amenities such as complimentary beach shuttles, tennis courts, private boat docks, Olympic-size swimming pools, hot tubs, and more. Our rentals are conveniently located near spectacular white sandy beaches and attractions like the Pensacola Lighthouse and Museum. For those looking to enjoy the outdoors, you will find plenty of opportunities for an adventure like kayaking and sailing. After a day of soaking in the sun or and evening exploring the nightlife - come home each night to a clean and comfortable rental with all the accommodations you need to relax.